Installed the Vmware tool in the RHEL7 guest system, during the installation, encountered compiling problem for vmhgfs application (for file share between host and guest system). Solved the problem by modify the vmhgfs source code and re-install. As my Windows system is 32bit Windows7, cannot install VMware workstation 12, I think below issue will not happen in latest version 12. 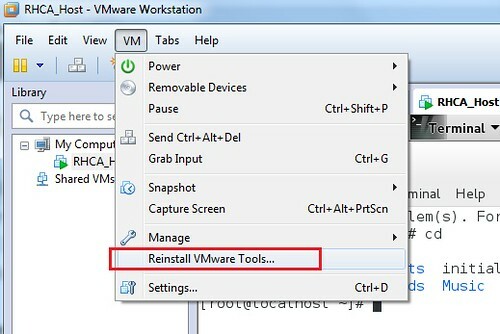 If requires vmhgfs when install Vmware tool, it will requires gcc and kernel-devel to compile, otherwise it will return error. [root@localhost Desktop]# yum install "kernel-devel-uname-r == $(uname -r)"
Recompile, this error will be solved. modify vmhgfs-only/shared/compat_dcache.h, line 54, this is related to kernel version. After modify, repack the source code, this problem will be resolved. valid path to the 3.10.0-327.el7.x86_64 kernel headers. /bin/make -C /lib/modules/3.10.0-327.el7.x86_64/build/include/.. SUBDIRS=$PWD SRCROOT=$PWD/. make: `postbuild\' is up to date. Restart the guest OS, use command df -hT to check the mounted file system, the windows shared .host:/ mounted to folder /mnt/hgfs, so the vmhgfs is working properly.